The left-hander from France clinches his third ATP Challenger career title. 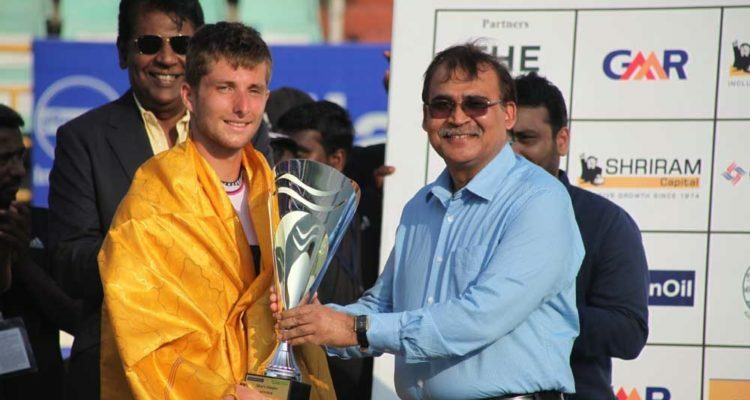 Corentin Moutet clinched the title of the 2019 Chennai Open. The No. 2 from France defeated unseeded Australian Andrew Harris 6-3, 6-3 in Saturday’s singles final at the SDAT Tennis Stadium, Nungambakkam, Chennai. Moutet broke his opponent’s serve four times and won 56 per cent of the total points played to prevail after one hour and 14 minutes. In his post match interview, Andrew who had been a top 10 junior in his earlier days said that he was happy to have played the way he did in this tournament. The 24-year-old was coming back after a long break during which was recovering from injury and completing his college. Following his third triumph on the ATP Challenger Tour, Moutet earns $7,200 in prize money as well as 80 ATP-Ranking points. This entry was posted in ATP Challenger News, ATP Challenger Tour and tagged ATP Challenger Tour, Chennai Open, Corentin Moutet.